Jerry and his wife, Sandy Sandy live on a small spread they call The Sandarosa, in the Pine Barrens of New Jersey. It's a place called Tabernacle, on the edge of the Wharton State Forest. The artsy couple is kept in line by their horse, Rita, six house cats, six barn cats and a bunch of well fed, neutered ferals. The property is home to much of Jerry's eclectic art. It adorns the yard and beyond, everywhere you look. It is quite a sight, with all the many varieties of back yard birds, wild turkeys, vultures, deer, all at home among the various sculpture gardens and rustic picnic areas. Their favorite among the outside residents are the hummingbirds though, that they get in droves every spring and summer. Jerry is instrumental in creating beautiful and effective hummingbird stations and plant / feeder stands to accommodate them. Trained as a tool and die maker, Jerry has been fixing gym equipment for over 25 years. The discarded parts often find their way into his sculptures. 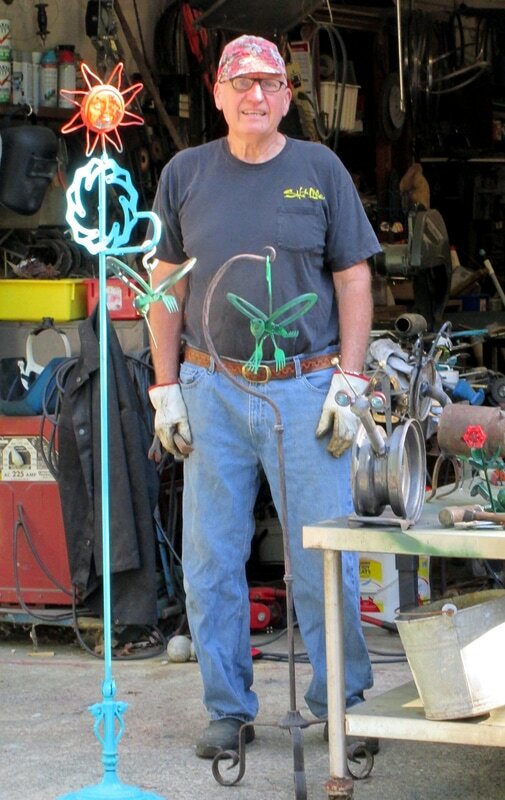 Creating metal sculpture art since the 1960's, Jerry enjoys the process of creating almost as much as Sandy. "I just need to create. ", he says; "It relaxes and energizes me." Jerry's folk art pieces evolve organically from scrap yard finds, discarded gym equipment parts, estate clean-outs and trash picked treasures. "I know good junk when I see it. ", Jerry chortles. "Sometimes I just look at something and it gives me ideas. Other times, I have to go looking for something I've imagined in my mind. Combining unlikely elements is always a challenge! I like making decorative stands and functional objects too. Popular animals like dogs or cats are in high demand, but it is always fun to create imaginary creatures like dragons or robots. They tickle my funny bone and stir peoples' imagination too!"